ENJOY THE WARMTH OF A SMOKY MOUNTAIN CHRISTMAS! The Great Smoky Mountains are a wonderful place to be! It's a place where we bless the name of Jesus and celebrate our Savior's birth! Theater shows in the Smokies are at their best during the Christmas season. 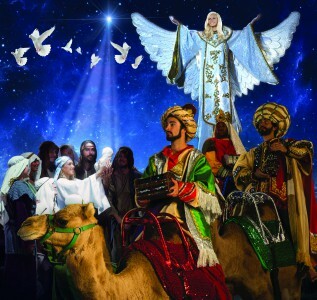 Some dramatize the birth of Jesus in their own unique way, while others fill the stage with colorful backdrops, comical skits, and famous Christmas characters. There's plenty of carols, music favorites, and great entertainment during each and every show! Go to Christmas Shows to learn more about these fabulous shows! A Holly Jolly Christmas is exactly what you're going to experience in Dollywood! The best time of the year comes wrapped in swaddling clothes along with the birth of the Christ child, twinkling lights, dynamic shows, and a colorful parade! Oh by gosh, by golly.... Christmas in Dollywood is filled with loads of Christmas cheer! The lights are spectacular! This awesome drive-through light show is one of the biggest in the country! Listen to music on your car radio as the lights dance before your eyes! The Shadrack show sits behind the Smokies Stadium in Sevierville! It's a new Smoky Mountain tradition that gets bigger and better every year!! Keeps the joy of the holiday alive all year long! The Incredible Christmas Place is an awesome place to go for decorating. Some of the most beautiful outdoor Christmas displays in the can be found right here! You'll see beautifully decorated and "theme" trees throughout the store. The Incredible Christmas Place carries a large assortment of ornaments. The Inn at Christmas Place is a wonderful place! This hotel is the place where Christmas lives! A huge Nativity is displayed beautifully while decorated trees adorn the lobby. A gigantic clock chimes beautiful tunes! Warm fireplaces set the stage for hot coffee and apple cider served free to guests. The rooms are most elegant! This colorful Smoky Mountain Christmas celebration brings millions of twinkling lights into the area. It brings with it a festivity of the holiday season that lasts until spring! Winterfest offers exciting competition, food, festivals, and loads of winter time fun! Enjoy a Smoky Mountain at its best during Winterfest! Bring the warmth of Christmas into your heart as you celebrate a Smoky Mountain Christmas!